It’s a great place to sit and chat. The walls are full of interesting photos and paraphernalia, cozy red benches flanking homey, old-fashioned formica tables and the rich smell of coffee lingers in the air. So sit and chat is what owner Shawn Ankenmann and I do at Highland Grounds, his coffee shop in downtown Flesherton. We’re here to discuss why an ordained United Church minister has opened a coffee shop in a rural community. Is this his new pulpit? Which sparks a whole discussion on what church is and is a coffee shop any different than a church? To understand where Shawn’s transition from minister to barista began, we go back to 1993 when he was ordained a United Church minister. He pastored in British Columbia and then, curious about the church connection to rural issues, he started his Masters of Rural Development. For instance, there is a noted School of Music in Brandon, Manitoba. There is also a church with a very nice grand piano. Could the two not combine to share resources and meet needs? Looking for pairings became a way of seeing the world for Shawn. When life took a turn with a divorce, a fire and a firing, he returned to Ontario to pastor the Flesherton United and Eugenia United Churches in the Grey Highlands. With a goal to become a consultant to rural churches on how to reach out to communities in new ways, Shawn looked around Flesherton. He saw the town had wonderful restaurants and small shops but did not have a coffeeshop where people could gather and purchase fair trade coffee. “Coffee shops are specific venues; a place where you can have a coffee, a chat or open your laptop and get some stuff done,” says Shawn. Now, nearing the end of his role as a minister and potentially losing the reverend status since he will not officially be leading a parish, Shawn has many thoughts about what church really is. First off, the United Church is going through a massive restructuring. As part of that process, Shawn is hoping the presbytery will continue to honour his title of reverend even though he will be moving from two-third time ministry to full-time coffee shop proprietor. He would like serving at a coffee shop to be seen as a chaplaincy. The idea isn’t without precedence. Shawn points out that in Vancouver, a church sold its building and opened a coffeeshop as a social enterprise/street ministry. In Calgary, a church put a coffee shop in its building. The thing is, some church congregations are aging, dwindling, becoming irrelevant in their communities. “Worship services are not speaking to what people are ... structured worship is not what people are looking for,” says Shawn. People still want to discuss spirituality but may not want to sit in a church service. Ultimately, Shawn came to see that church is not just Sunday morning worship. Church can be a coffee shop. Most people who come to the coffee shop know he is a minister. Some don’t. It doesn’t matter to Shawn. Shawn may not be your typical minister. “I believe in looking after the person; caring for the person,” says Shawn. His intent is to share faith, not seek to convert. He thinks of a gentleman who comes in who has issues with his extended family. “He is not a Christian person but he comes to talk with intent,” says Shawn. Another time he had nine clergymen from different denominations come in for coffee and a chat. “That was cool,” remembers Shawn. He welcomes all. A pride flag hangs right above the counter indicating everyone is welcome to come and have a cup of coffee. “We had a lesbian couple come here on their first date,” remembers Shawn. “It is safe here. 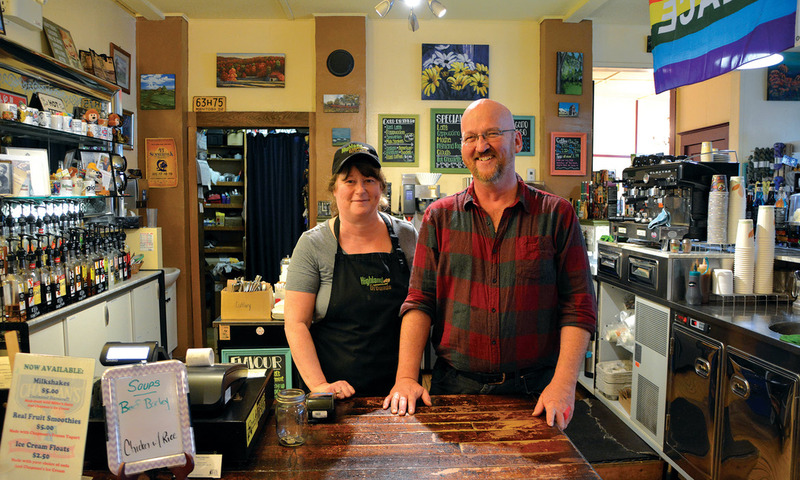 Everyone can come.” He wants Highland Grounds to be a place where people connect. I see it in action as a man with Down’s Syndrome comes in for his cup of joe. There is a handshake, a joke, laughter and a palpable sense of camaraderie and connection. Part of Shawn’s call as a Christian is to care for his neighbours, near and far away. Selling fair trade coffee is an important aspect of Shawn’s business and ministry. “It’s all part of it ... that we are actually doing good just by drinking the coffee,” says Shawn. One of the product lines he carries is Level Ground, a company based in British Columbia. Level Ground trades fairly and directly with small-scale farmers in developing countries with the vision to alleviate poverty. Helping Shawn achieve his vision, create community and very importantly, keep the books in order, is Shawn’s life partner, Renee. An accountant, she now makes the soups and bakes the treats served over the counter. She watches how people who would never go to church come to the coffee shop to talk to Shawn. “They just need someone to talk to. It happens all the time ... everyday,” she says. “It’s like having a family that is not your family,” she says. Ultimately, Shawn’s life goal is about “living the welcome.” Welcome is a word written on most church signs but for many reasons, people don’t always feel welcome at church. Shawn’s goal was that this coffee shop would truly manifest the word welcome. As I leave the restaurant, I comment on the big, blue, bridge sign honouring his father, an OPP officer.